Clearasil Ultra Acne Rapid Action Treatment Gel visibly reduces redness and pimple size in as little as four hours. 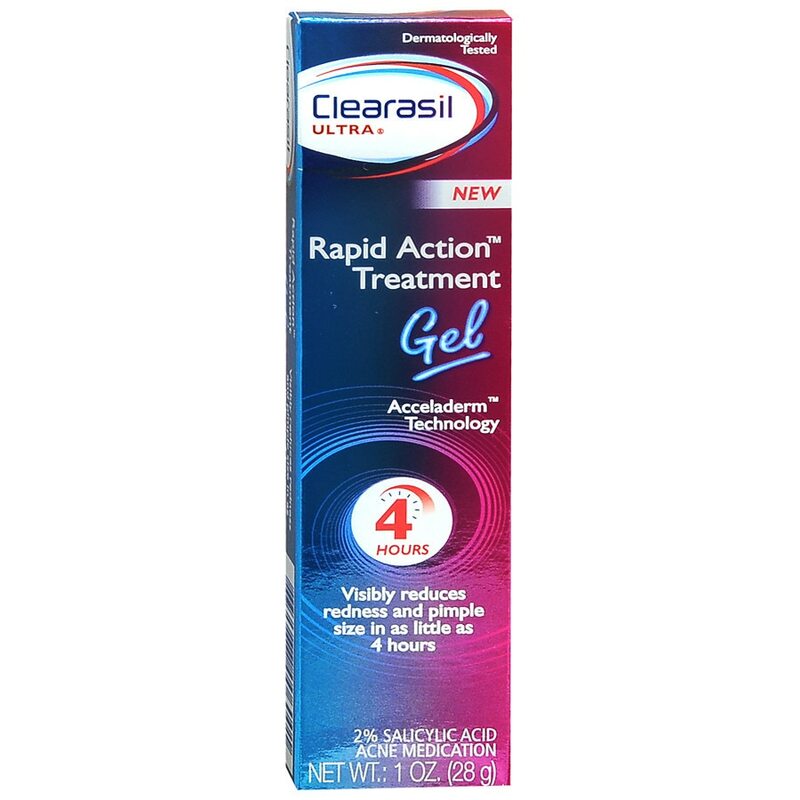 Clearasil Ultra Rapid Action Treatment Gel (1 ounce) with salicylic acid 2% acne medication. It is scientifically formulated with Accelarderm technology to accelerate the delivery of acne medication and penetrate pores, so you get visibly clearer skin fast. When you are fighting acne, faster is better. Clearasil Ultra Rapid Action Treatment Gel is dermatologist tested to visibly reduce pimple size and redness in as little 4 hours. It is scientifically formulated with maximum strength acne medication and works to penetrate pores. So you get visibly clearer skin fast. The treatment gel contains salicylic acid 2 percent maximum strength acne medication to fight acne and treat problem spots. Designed with Acceladerm technology to treat acne fast, it features a key ingredient to penetrate pores and give you a clearer complexion. When you are fighting acne, faster is better. Clearasil Ultra products are scientifically formulated with maximum strength actives to effectively treat acne. Whether you're looking for a Face Wash, Face Scrub, Acne Treatment, Acne Pads, or Acne Kit, our dermatologist tested products have you covered. With Clearasil Science you can have visibly clearer skin fast. With other topical acne medications, at the same time or immediately following use of this product, may increase dryness or irritation of the skin. If this occurs, only one acne medication should be used unless directed by your doctor. Stop use and ask doctor if skin or eye irritation develops. Keep out of reach of children. In case of accidental ingestion, het medical help or contact a Poison Control Center immediately.